Complete with every confort (air conditioning, stereo, tv)terrace for relaxation. "Excellent holiday! House is fantastic. Location great. Scopello is a beautiful village, with many great beaches nearby. Perfect for viewing the many sights & places of interest in this part of Sicily. Highly recommended!!!" 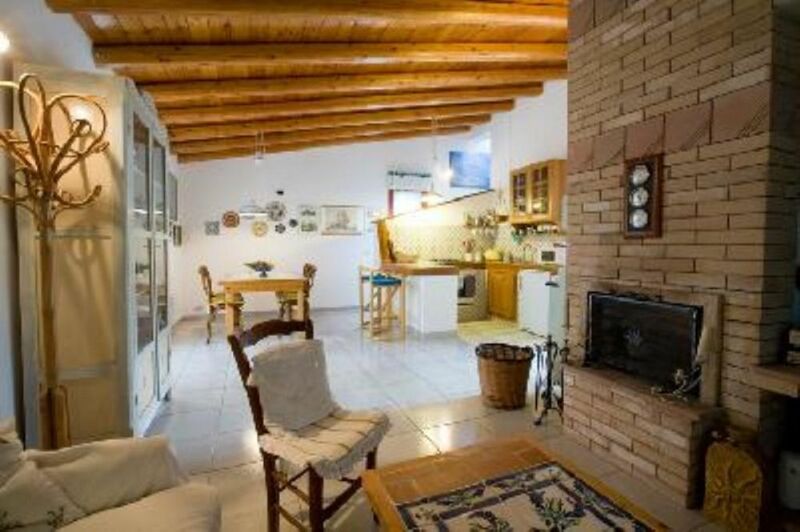 "Very nice and clean house, easy to access, close to the nature reserve and nice restaurants. The layout of the house with two double bedrooms and 2 bathrooms was ideal for our trip. The dog next door was very noisy barking all night on the first night we got there but apart from that we really enjoyed our stay and thought the accommodation was lovely." "The property was in reality even better than in the advert. The double bedrooms, two bathrooms, kitchen, dining area were larger than expected. The areas for sitting and relaxing (always in the sun) were excellent. It was also quieter than we anticipated. Everyone we met was exceedingly friendly - the local shop and local wine and fruit and vegetables were first class. The sea views and local reserve at Scoppello were stunning and eating out there was really good (and very reasonable). "I particularly enjoyed walking down for a swim first thing everyone morning and being the only person on the beach and in the sea (which was warmer in May than the sea is in England in August!)". "The best part of the holiday was the time spent on the patio of the property". Annalisa couldn't have made us feel more welcome or been more helpful. It is our first visit to Sicily – we will definitely come again and definitely come back to this property. We were all bowled over with the sites, the scenery, the mountains, the food, the friendliness, thermal baths,the sunshine, the ease of travelling on the roads - (local driving may be more 'exciting' than in the UK, but at least there is no road rage!). The propery was very accessible. We were all really sad to be coming home!" "Annalisa and Enza made us very welcome. We arrived late to find that they had kindly supplied us with next days breakfast. The house was comfortable and clean and situated in a very quiet environment, near to many interesting attractions. A lovely holiday." Maison de vacances mitoyenne des propriétaires et de "bed and breakfast". Avec une terrasse couverte à l'arrière de la maison et tout le confort pour un séjour agréable. Par contre nécessité de disposer d'une voiture pour se déplacer (courses, plages, visites). Ho soggiornato insieme alla mia famiglia in questa bella villa a Scopello nel mese di luglio 2018. La villa è ben arredata, e in tal senso non sembra la solita casa vacanza, accessoriata di tutto ciò che serve per le attività quotidiane; è dotata di due bagni e di un locale lavanderia esternamente (con lavatrice). Inoltre c'è un bel giardino interno dove poter consumare i pasti circondati dal verde.E' dotata inoltre di parcheggio auto interno con copertura. Le foto allegate dalla proprietaria rispecchiano le parti interne ed esterne della villa. La villa si trova in posizione strategica a pochi minuti dal borgo di Scopello, dai faraglioni e dalla tonnara, dalla baia di Guidaloca e dalla riserva dello Zingaro. Nel mese di luglio 2018 è stato aperto un market (con prezzi ragionevoli) a pochi metri. La proprietaria è una persona molto cordiale, pronta a fornire suggerimenti e indicazioni utili, e disponibile a rispondere ad ogni richiesta. Necessario essere motorizzati.